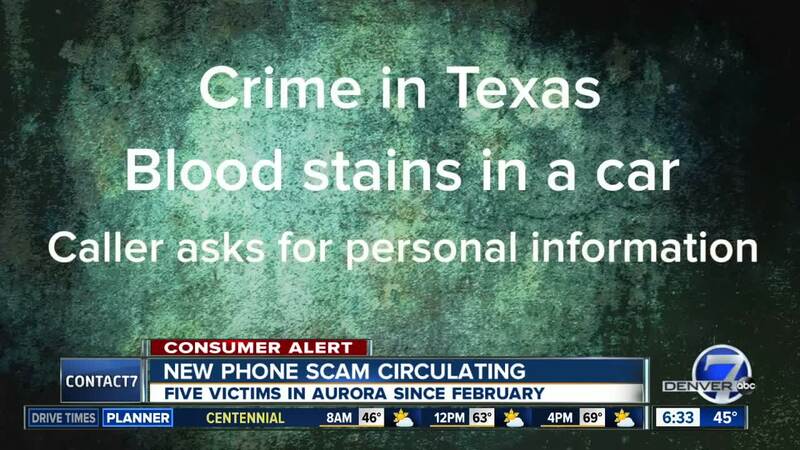 AURORA, Colo. — At least five people have come forward saying they were the latest victims of an IRS phone scam, according to the Aurora Police Department. It started circulating in Aurora in February. According to investigators, the call usually comes from Texas. The voice on the others side of the call tells the victim that a car was rented in their name and that blood was found in the vehicle. "The caller then says the IRS is after you and that you need to give them your social security number," said Sgt. Dan Courtenay with the Aurora Police Department. One of the numbers is still active. When Denver7 reporter Eric Lupher called one of the numbers at 614-924-6566 he was put on a brief hold and then someone came on the line. The operator told Eric that his information had been compromised and that he needed Eric's social security number to confirm his identity. When Eric asked for more information the operator said that Eric's personal information had been compromised and that he needed Eric's social security number to confirm he was talking to the right person. That's when Eric hung up the phone. Sgt. Courtenay says the IRS never asks for personal information over the phone. You will get a letter in the mail if there are any issues. These scams specifically target the elderly.